PaperForm is made of two words: paper and form. Brought together, these words also contain the word perform. Yes, everything’s in the title. PaperForm is a reading group that looks at papers and their form. In other words, its main concern is the formal aspect of the delivery of papers (e.g. at conferences). PaperForm considers a conference paper as a performative act: the reading group has a sustained interest in performativity and its implications in the life of an ‘academic’. PaperForm focuses deliberately on practice, as opposed to theory. PaperForm gives you space to present papers and receive feedback on the formal aspect of your delivery in a friendly and laid-back environment. PaperForm aims at bringing postgraduates together to share more or less ‘academic’ interests. PaperForm, although it is all about form, is definitely an informal workshop that takes place every two weeks on Mondays. It’s open to all postgraduates in ENCAP. The PaperForm workshops will resume on Monday 31st January at 4.10pm, in room 2.46. Any questions? Contact Étienne or leave a comment here. Shakespeare’s Globe is planning to build an indoor Jacobean theatre to complement our world-famous open-air stage. The shell of this theatre already exists to the left of the Globe’s main foyer entrance. Shakespeare wrote for both types of playhouse and it was always the intention of Sam Wanamaker to create an indoor Jacobean theatre alongside the outdoor theatre. It is only now that we are ready to build this second theatre. It will follow authentic designs and craftsmanship of the period to create a theatre that Shakespeare would recognise. With two tiers of galleried seating and a pit seating area, the indoor theatre will inspire a uniquely intimate and intense theatre experience. The indoor theatre will provide a second stage, allowing theatre productions to play throughout the winter, widening the Globe’s repertoire and further extending the understanding of the nature of Jacobean theatre. The new theatre will host a number of visiting companies and could become one of the most important venues for the performance of early music in the capital. Playing in a period-appropriate indoor space will add a new dimension to the tragedies of contemporary writers such as Middleton and Webster, and to the sharp city comedies that would have been so relevant to the Jacobean public. It is also an exciting prospect that we will have a space for staging works that have not been seen since their seventeenth century premieres. Find out more from the Globe website here. Read BBC NEWS article on this story and multilingual Shakespeare here. A series of five essays on Montaigne to accompany a major Radio 3 drama about the French essayist called ‘Living with Princes’, written by Stephen Wakelam with Roger Allam as Montaigne to be broadcast on Sunday, January 23, 2010 on Radio 3. The essays will be written and read by the writer and broadcaster Alain de Botton; the philosopher and historian Theodore Zeldin who will explore to what extent Montaigne’s philosophy on life holds true today; writer and Shakespeare scholar, Jonathan Bate, who will be exploring the relationship between Montaigne and the Bard; the writer and biographer of Montaigne, Sarah Bakewell, on Montaigne’s cat, scepticism and animal souls; and the philosopher A.C.Grayling. Listen to Jonathan Bate here. Inspired by the RSC’s individual plays and sponsored by the Royal Shakespeare Company and the British Shakespeare Association, The RSC Shakespeare Student Award is a new, innovative award aimed at students of English Literature and Drama from 18-25 years. The prize can be won by students from any country and involves entrants submitting an essay on Why Shakespeare is Relevant Today. Terms and conditions apply. All entrants must be 18 years and over. Closing date for entries: 31st January 2011. Entries must be between 1,500-2,000 words in length. Entries must be submitted to: rsc@macmillan.com with entrant’s name, email address and contact number with an attachment of the essay. For website and T&Cs press here. A rare folio of Shakespeare’s work is being displayed at Durham University. 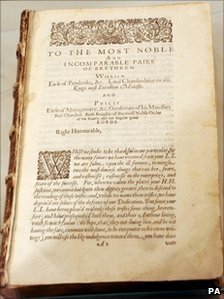 The 1623 first edition of the bard’s work was stolen from the university in 1998. Its bindings and some pages were removed to try to disguise its origins. Visitors to the exhibition at the new Wolfson Gallery at the university can view it in its current condition. It will be conserved to protect it from damage after the exhibition. It is one of the earliest examples of a gathering together of the playwright’s work. Raymond Scott, 53, of Wingate, County Durham, was cleared of stealing the book, but found guilty of handling stolen goods and jailed for eight years in July. He was also convicted of taking stolen goods abroad. The folio, which has an estimated value of £1.5m, will form the centrepiece of the Treasures of Durham University in the refurbished Wolfson Gallery. The new gallery has undergone a £2.3m refurbishment, funded in part by a £500,000 donation from the Wolfson Foundation – a charity that awards grants to support excellence in the fields of science and medicine, health, education and the arts and humanities. Chancellor of Durham University, Bill Bryson, is the guest curator of this first exhibition, which covers topics including culture, science, faith and religion, reform and rule, and local history. The treasures have been drawn from collections across the university. The Shakespeare First Folio will be on display until 6 March. Visit the BBC page for this story here. You are currently browsing the Cardiff Shakespeare blog archives for January, 2011.